China is cracking down on an online suicide game called “Blue Whale” that originated in Russia. Authorities have begun blocking keywords related to the game on local search engines, and numerous game groups on social media have been dissolved. On May 12, a Chinese teen was arrested for spreading extremist thoughts online while participating in the game. The game is organized through social media, and players have to complete a series of tasks, including waking up at 4:20 am for 50 consecutive days. Some of the tasks involve self-harm, and players can ultimately be encouraged to commit suicide. Russian media outlets have widely reported that the “Blue Whale” suicide game has been responsible for more than 130 suicides in Russia and has been widely spread via tabloids in different countries, including China, though news outlets, including Radio Free Asia and Meduza, and fact-checking website Snopes has pointed out that the claim has not been proven and may be overblown. The warning was based on the Chinese cyber police’s call for a boycott on the game. In China, where Internet censorship is systematic and pervasive, the noise around the game has turned into a political campaign. Global Voices also covered this phenomenon in two of China’s Central Asian neighbors, Kyrgyzstan and Kazakhstan. Given China’s sophisticated online censorship environment, the claim that the “Blue Whale” game had entered China on any serious scale should be viewed with some skepticism. As in Kyrgyzstan and Kazakhstan, evidence suggests that the real swell of interest in the game began after the media and online campaign against the groups. [Please report on “Blue Whale”] “is a suicide game originating from Russia. The game encourages gamers to carry out self-harm tasks consecutively over 50 days. Many young people have been induced to end their lives. QQ groups like “wake me up at 4:20am” have appeared in our country. “The QQ security team has started cleaning up these groups. Behaviors associated with the “Blue Whale suicide game” are criminal behaviors as it involves organizing and inducing others to self-harm and suicide. 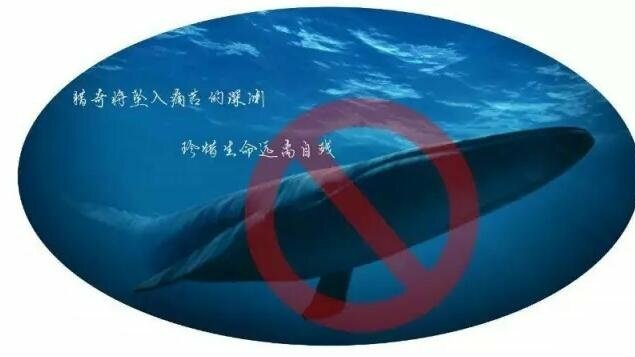 A message, “Please stay away from activities that could induce self-harm,” now pops up in the Baidu search engine when users search “Blue Whale.” All associated search results have been cleaned up to make sure that searches do not link to websites that advocate for self-harm or suicide. Sina Weibo has blocked search terms and deleted messages associated with the game. Cyber police offices from all across the country have assisted the crackdown either by reposting warning messages or investigating netizen reports. In most cases, the police have asked the group’s administrator to dissolve the group. But in Guangxi Province, Zhanjiang City, police detained a 17-year-old on charges of “spreading extremism” by posting images and comments encouraging acts of self-harm “tasks” to a chat group on QQ on May 12. The teenager told the police that he joined the QQ “Blue Whale” game group on May 9, after local media outlets launched the campaign. According to Guangxi police, his QQ group originally set out to sell computer software and clothes. In order to attract more members, he started posting information about “Blue Whale” after he read the authorities’ warning on local media outlets. He also posted an image showing an arm with a blue whale cut into it, and fabricated information that 11 members of the group have “finished the task,” managing to attract more than 200 new members to his group in the process. The teen’s experience suggests that media coverage and the aggressive effort to curb participation in the game may be attracting more public attention to “Blue Whale,” thus having the opposite effect.